If you haven't already heard the rave reviews of the new History Channel series The Men Who Built America go check it out. Each of the 2 hour segments covers the first wave of tycoons in America starting with Cornelius Vanderbilt and moving onto to John D. Rockefeller, Andrew Carnegie, and J.P. Morgan. You can read more about The Men Who Built America here. The first ever growth through through acquisitions course for entrepreneurs. Learn from the very best: the tycoons who did it. How Billionaires Become Billionaires: How to accelerate the growth of your business. If you have built a company in the past you know that the initial 25% or 50% growth rate quickly levels off to a measly 5% on average. Savvy entrepreneurs, those who are destined to become tycoons, know that at that point it's wiser to grow through acquisitions of related businesses. Acquisitions enable you to continue growing at 100% per annum or more. Plus deal-making is by far the most fun way to grow a business and build wealth. There's a new course on how to do this. Find out about the Billionaire Strategies Course which teaches you how to enter into M&A deal-making. As with all of my works, this is a politically incorrect approach to exploiting capitalism to your benefit. Reuters on the Forbes billionaire list. The list of billionaires just keeps getting longer and longer with distribution being spread out over the globe. As with most business stories, the early days are the most interesting. After serving in the military during the Korean War, Chuck earned a degree from the School of Hotel Management at Cornell. Shortly after graduating, he went to Europe where his entrepreneurial radar picked up on an opportunity to make money following the US fleet from port to port in the Mediterranean in order to sell sailors duty free booze. Chuck's venture must have been one of the first affiliate businesses in that he simply took orders from his customers and then had the product drop-shipped to their stateside addresses. He never touched the merchandise or invested a dollar in inventory. In fact, he and his partners never invested a dollar in the business. It grew to over four billion in sales on internal cash flow alone. This is quite an amazing feat. After becoming successful in Europe catering to the US armed forces with duty free liquor and cigarettes, he started partnering up with other Cornell hotel management grads and expanded into the Pacific by going after the same customers. The business was a strong cash cow from the beginning but didn't really take off until the sixties when his company caught a new demographic wave. In the sixties, as Japan's economy started booming its citizens began traveling outside the country on their vacations. One of their favorite destinations was Hawaii where Chuck and partners opened their first duty free retail store at the main airport. They set up arrangements with Japanese travel agents and Hawaiian tour companies to steer the tourists to this store. The customers incorrectly assumed that everything in the store was duty-free and would load up on watches, jewelry, clothing, and cameras in addition to liquor and cigarettes. The partners made a killing over the next few decades by opening up additional duty free stores around the globe. What stood out for me in the story was just how disorganized the company was for most of its life even after it had become a huge international force in retailing. The four main partners basically operated it as four separate fiefdoms spread across the globe. The partnership agreement was a verbal one as to who owned how much equity. Almost nothing was papered. Over time the two founding partners grew cold and distant over a number of disagreements but in the end, after much exasperation, they managed to come together in order to sell the company at its peak to a French retail giant. After that sale, the demographic tide turned against the company. Over time, Chuck decided to shed his wealth which was estimated to have surpassed a billion in net worth. In the late 1990s he set aside money to take care of his wife and kids for life and then bequeathed the rest to a charitable foundation. At the end of the day he was personally worth a measly million dollars or so but everyone continued to assume that he was still a billionaire. Chuck's give-way was motivated in part by the example of Andrew Carnegie, one of the wealthiest men in history, who also gave away his fortune while he was still alive. 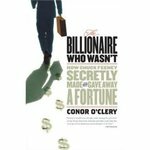 If you enjoy biographies, especially ones of successful businesspeople, you will probably enjoy The Billionaire Who Wasn't: How Chuck Feeney Secretly Made and Gave Away a Fortune. There's an interesting piece in the WSJ on pursuing wealth for wealth's sake and nothing more. You're Not Super Rich? You Lucked Out. Whenever my kids swoon over a palatial home or a passing Ferrari, it always bugs the heck out of me. Before long, I am on my soapbox, insisting that they shouldn't be awed by such symbols of wealth. This might sound odd coming from a personal-finance columnist. But the fact is, while it is comforting to be financially secure, money is no measure of self-worth, no guarantee of happiness -- and no reason to be impressed. Yes, Paris Hilton should strike fear in any responsible parent's heart. I recently finished Martin Fridson's How to be a Billionaire: Proven Strategies from the Titans of Wealth. One of the most important observations he offers about billionaires is that they tend to have little regard for the status quo and the rules of behavior that support it. For example, if they see an opportunity to take over an industry, they go for it regardless of the acrimony from established players which such action will trigger. One popular strategy for upsetting the industry apple cart and achieving dominance can be likened to business bliztkrieg. This entails spotting the industry choke point and seizing control of it. Let's illustrate this strategy with a number of examples from various sources. One of the finest books on business strategy is actually The Robber Barons despite the fact that Matthew Josephson didn't set out to write such a book. The Robber Barons were absolute masters at identifying and controlling the choke points in various industries—particularly railroads. For example, if freight had to be transported by two or more separate railroad lines, as was often the case back then, to get to its ultimate destination, the Robber Barons would look for a means to shoehorn themselves into a controlling position with as little investment as possible. Often this was achieved by acquiring control of a small railroad that served as a connector between two larger lines. Why spend a fortune to buy a huge line when you could maximize control with minimum investment by only controlling the choke point? This strategy was employed over and over again by the so-called Robber Barons. Standard Oil's founder John D. Rockefeller, perhaps the most famous billionaire of all time, had an aversion to free market competition for good reason. In the early days of the oil business the industry was comprised of thousands of small wildcatters who often competed solely on price which led to never-ending boom-or-bust cycles. When you have everyone trying to underbid everyone else dotcom era style, the effect on profit margins is disastrous. As a result, Rockefeller began looking for a means of creating cooperation amongst suppliers in order to stabilize oil prices at sustainable levels. Initially he looked at acquiring control of the oil fields themselves. However, he quickly discovered that he couldn't afford to buy out all the thousands of wildcatters. Not even Rockefeller pockets were deep enough for this strategy. He then realized that the next two links in the oil industry's value chain, refining and transportation, was comprised of far fewer players. Here he had the financial strength to dominate. He moved quickly to buy most of the refineries. Those he couldn't induce into selling were blown up by gangs in his pay. (This apparently was one of the earliest recorded uses of the newly invented explosive called "dynamite".) In order to secure the most favorable shipping rates, he had to use a different strategy. Here he had to form mutually beneficial alliances with the rail road owners because his fellow billionaires weren't likely to respond in the desired manner to intimidation tactics. In the end, he achieved his goals in both sectors. The Martin Scorsese movie Casino opens with an extended scene in which Robert De Niro's character explains how Las Vegas came to be. In a nutshell, the Mob and the Teamsters completely controlled access to the city in the early days. If someone wanted to build anything larger than a bread box approval had to be gained from both parties. Without their approval, your building materials would simply get lost on the way to the city. Another more recent movie example of the use of choke points is 300. Since almost everyone has seen it, I don't need to dwell on the details of how a small group of Spartans held off the Persian army by controlling the narrow Pass of Thermopylae until Greek reinforcements could arrive. In the online world, the most powerful choke point is Google. With search market share somewhere between 60 and 80%, depending on which source you use, the company completely dominates the Net from the perspective of small business. Read my two earlier posts on Google's unhealthy market dominance by following the links. The second article, Is Google Really Good for Small Business?, has generated a lot of interest. In MBA programs students are taught to analyze the links in an industry's value chain and ask, "Where would be the best place to play if I wanted to enter the industry?" One obvious way to answer this question is by looking for choke points which can be dominated. You don't need John D. Rockefeller's resources to employ the choke point strategy. Oftentimes, you can use it to achieve dominance in one sector of an industry for a brief period--one just long enough to trigger windfall profits. I have one client who has been scrambling to corner the market for a simple connector part which allows an important peripheral device to be attached to one of the hottest selling gadgets out there today (sorry, I am sworn to secrecy here). If you're interested in investing in yourself by learning more about how to implement this particular billionaire strategy and others, check out my new Billionaire Strategies Course. If your business career is just starting out, you should invest in a copy of The Smart Startup Guide on financing startups.